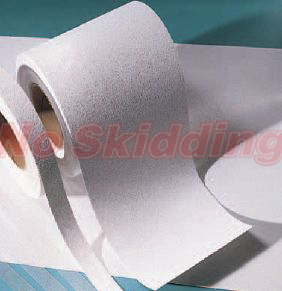 Anti Slip Vinyl Bath Strips . Non Slip Bathtub. 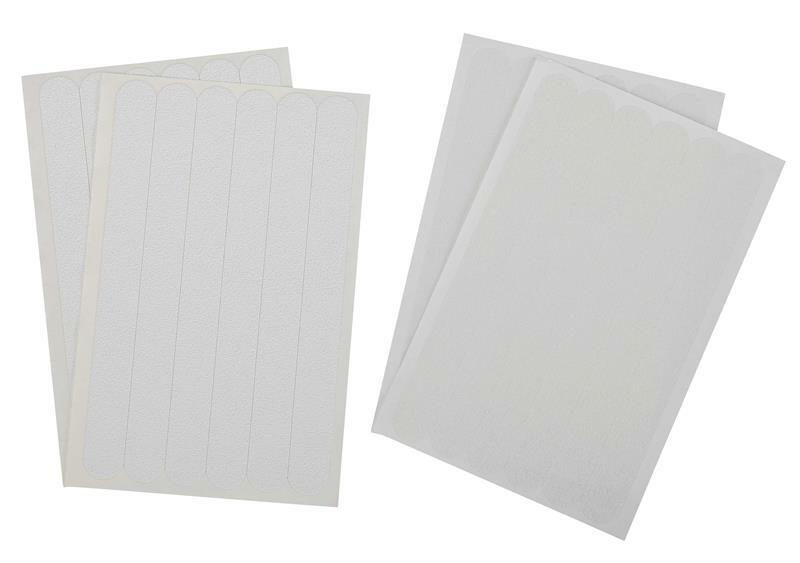 Priced per strip but supplied in multiples of 100 strips. Each strip measures 0.75 inch by 7.5 inches and is clear. Have been used in hospitals, hotels, motels, and residences for years. Engineered from a unique type of vinyl that is comfortable to the skin and pleasing to the eye. 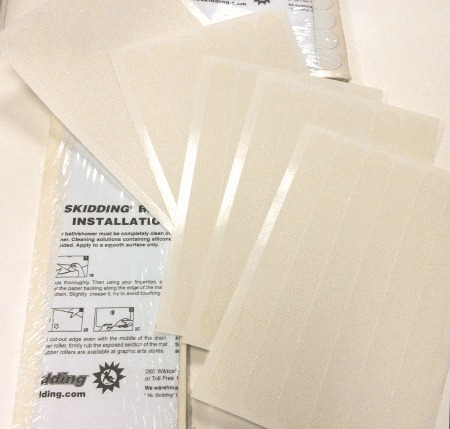 No Skidding® Anti Slip Vinyl Bath Strips are extremely durable and typically outlast conventional rubber mats. they have a life expectancy of years, not months. Cleaning is easy. There is no additional maintenance required other than cleaning on a regular basis. Our strips are available and stocked 0.75 inches by 7.5 inches but we routinely do custom sizing for larger projects. Our bath strips are completely sanitary. Vinyl construction can limit the growth of odor causing germs and bacteria. Will not fade or wash out. 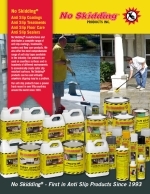 Mistake-Proof Application - Application is as simple as peeling off the release liner and pressing firmly onto a clean, dry tub surface. When you are ready to replace your vinyl bath strips, just lift the corners and remove. No Skidding® Anti Slip Vinyl Bath Strips release cleanly with no remaining residue to be concerned about. Designed to provide firm safe footing in the tub or shower. Bonds firmly to the tub for a slip-resistant surface. Easy to install and maintain. Supplied in 7½” strips, 100 per package. 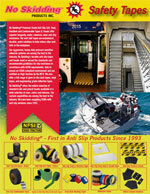 For more information, please visit this product DATA sheet and BROCHURE. Designed for indoor wet, barefoot-traffic areas. Non-mineral, fine-textured, slip-resistant vinyl surface that has our water-resistant, acrylic adhesive that is ideal for wet conditions. Indoor applications include: Showers, bathtubs, locker rooms, therapy rooms, swimming pools, around hot tubs, surfboards, step stools, aquatic equipment, and many more applications. Engineered from a unique vinyl. Comfortable to the skin, pleasing to the eye, easy to clean, durable. Barefoot friendly. Designed for wet, barefoot-traffic areas. Used in hospitals, hotels, & residences for years. For heavier texture order NS4400 series. Our vinyl tape is completely sanitary. Vinyl construction can limit the growth of odor causing germs and bacteria. Suitable for indoor applications such as bathtubs, showerss, therapy rooms, etc. Indoor applications. Non-mineral, fine-textured, slip-resistant vinyl surface that has our water-resistant, acrylic adhesive that is ideal for wet conditions. Engineered from a unique type of vinyl that is both comfortable to the skin, pleasing to the eye, easy to clean and durable. Barefoot friendly. Designed for wet, barefoot-traffic indoors areas. For coarser texture order NS4400 series. Indoor applications include: Showers, bathtubs, stairs treads, boats, locker rooms, therapy rooms, and equipment entryways, swimming pools, around hot tubs, surfboards, step stools, aquatic equipment, and many more applications. Barefoot friendly. Designed for indoor wet, barefoot-traffic areas. Non-mineral, fine-textured, slip-resistant vinyl surface that has our water-resistant, acrylic adhesive that is ideal for wet conditions.